Who is affected by big currency movements? 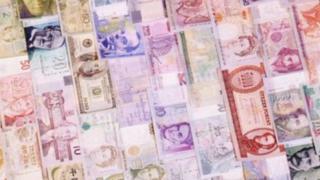 Some of the largest economies in Asia have seen big movements in the value of their currencies in recent months. Other than domestic factors, the potential tapering off of the US Federal Reserve's cheap cash injections is partly responsible for the volatility. The US central bank's moves had allowed billions of dollars of inflows into emerging economies, and now that money is leaving and it is having an impact on their economies. For some countries in the region which rely on exports to drive growth, it helps to have a weaker currency. For others that have to import a lot of what the country needs, it is not beneficial. Our correspondents around the region have been finding out how the currency movements are affecting people and businesses. India's currency has been in freefall recently. Over the past few months the rupee has fallen nearly 15% touching record lows and crossing the psychological level of 60 to the US dollar. Stock markets have been in disarray due to the currency's poor performance. India's finance minister, P Chidambaram, has indicated that this is a global trend and so there isn't any reason to panic, but the Indian rupee has been among the worst performing currencies in Asia. Some economists say that the recent slide has been due to global factors, particularly because of the strengthening of the dollar and signals from the US that it may start cutting down on stimulus spending. Several sectors are being badly affected, prime among these, are petroleum companies and automotive manufacturers who rely heavily on imports. The falling rupee could widen India's current account deficit, which has already been a big concern for the country. Analysts say what is more worrying than the weak level of the currency is how volatile it's been over the last few months. Many firms have put a hold on business, waiting for some stability. "I'm not taking any new imports, any new consignments until there is some stabilisation. We fear that the dollar may even go to 65 rupees," says Lal Hazari, an electrical goods dealer in Mumbai. The currency fall comes at a bad time for India. The country has just begun to recover from the slowest growth in a decade, and a weakening rupee may hurt any recent improvements in the country's economic situation. Inflation, which has been easing in recent months could rise again. Gas and oil prices have already been hiked. Experts say the currency depreciation could also have an impact on the fiscal deficit, which has been narrowing over the past few months. While India's central bank has stepped in a few times to sell dollars and stem the slide, experts say that these are only short-term measures and what the country needs are long-term solutions like kickstarting the investment cycle in India and increasing foreign cash inflows. Capital flows into Asia have pushed up the Philippine peso against the US dollar and one of the groups feeling the pinch the most is overseas workers. Domestic helpers in Hong Kong may earn less than half of the average salary in the Chinese territory, but they are able to boost local consumption and support their families back in the Philippines. Myrna Nejar is one of the 159,000 Filipino maids in Hong Kong feeling the pressure. The wage she earns supports her daughter, granddaughter and elderly mother back in the Philippines. Just before the global financial crisis hit in 2008, Ms Nejar sent three-quarters of her salary back home. Since the local currency is pegged to the US dollar it amounted to roughly 16,700 Philippine pesos. But after successive rounds of quantitative easing by the US Federal Reserve, the US dollar has weakened and investment flowing into the Philippines has diluted the value of Ms Nejar's wage. She is now sending roughly 20% less Philippine pesos back home. It's a big adjustment for her 79-year-old mother Sophia Nejar. "I have to budget very carefully now. I eat less meat so that I can still buy my medicine and milk," she tells the BBC through an internet-based video call from her home in the Philippine province of Antique. Filipino maids try to find ways to send home the same amount of Philippine peso as before. Many resort to borrowing. Others cut back on their own spending in Hong Kong on food and clothing. The sacrifices made by domestic helpers worked. Last year, they were among the millions of overseas Filipinos who sent a record $21bn to the Philippines. It has moved families out of slums and helped them join the emerging middle class. For many domestic helpers in Hong Kong though, it's a struggle to keep up the momentum. Ten years ago this month a group of senators wrote a letter to the US Treasury Secretary urging him to stop China cheating on its currency, and they've been at it ever since. Just last month yet another attempt was made to introduce a law designed, in large part, to punish China for keeping the yuan, or renminbi, artificially weak. It may have appreciated some 35% since 2003, the argument goes, but it is still too weak. Just look at the growing trade deficit. A trip to the EAE Automotive Equipment Company factory in Suzhou, in eastern China, suggests Washington might have a point. Up to 80% of the hydraulic vehicle lifts made here are for export. The boss, Zhang Shujun, tells me that the rising currency is not yet causing real pain because much of it has been offset by the falling price of Chinese steel. Nonetheless, they are noticing an effect - this year alone a 3% dip in profits, she says, directly as a result of the renminbi price. She is not keen for it to strengthen further, faster. The more interesting question though is not about the correct value of the renminbi right now. Rather, it is about why China has been allowing it to strengthen, albeit slowly, for the past 10 years. The answer might be something to do with the now well-documented great Chinese rebalancing act - the shifting of priorities away from an export and investment based economy. A stronger currency, of course, helps in this regard, by boosting consumer demand. So some analysts expect the renminbi to continue its steady trajectory for a little while longer. Maybe all the US needs is a bit more patience. South Korea is paying close attention to Japan's new economic policies. Nicknamed "Abenomics" after Japan's new, nationalist prime minister, the new policies have led to a dramatic shift in the value of the yen. This has made Korean goods more expensive for Japanese consumers - a worrying trend for South Korea, which relies on exports. Trade between the two countries was worth more than $100bn last year - less than half that between South Korea and China, but nevertheless still enough to make Tokyo one of Seoul's top trading partners. Some smaller companies say it's they who are bearing the brunt of that currency volatility, as Korea's big multinationals which underpin the economy pass on the costs to their contractors. But the weakening yen has also made Korea itself more expensive for the Japanese to visit. South Korea's Tourism Organisation says the number of Japanese visitors increased by around a third in the first half of last year, but has since declined, with no sign of a rebound. Seoul's restaurants, shopping malls and popstars are all big draws for Japanese visitors - many of whom return year after year. "Of course the exchange rate is a problem," says Choi Yoon Jea, the head of a kimchi-making school set up for tourists in Seoul, "because the biggest reason Japanese come here is for shopping." But many of those in the industry, including Mr Choi, say there's more to the drop in visitors than simple economics - and that politics is playing a part as well, as the ongoing diplomatic coolness between the two countries continues. The over-achieving Australian dollar has spent much of the past three years lording it above its American cousin. Life beyond parity with the greenback has been especially painful for Australian manufacturers and tourism. It has made imports cheaper, and has sent the price of many exports soaring. "It's largely changed the landscape of the Australian industrial outlook," says Michael McCarthy, an analyst at CMC Markets. "A high Australian dollar meant that our rigid labour markets and high cost of labour has put most of manufacturing into an uncompetitive position." To survive, firms have had to innovate. Competition from China and Taiwan has forced Lifestyle BBQs, a family-run company in Sydney, to shift its focus away from the low-cost end of the market, to premium sales. "There are a lot of products available to customers who want to purchase a barbecue at very low prices, because of the high Australian dollar," says owner Blair Boaden. "You can walk into a store and it's available for between 400 and 800 [Australian] dollars. And it all seems perfectly adequate. Whereas our product sells in the equivalent form for between 2,500 and 3,500 dollars." However, in recent months there have been many pressures on the Aussie dollar; from the strength of the US and Chinese economies, to interest rates and the softening of the mining boom. And that has provided some much-needed relief for those weighed down by a muscular currency. The mighty "Aussie" has lost more than 10% of its value since mid-April.